1.10 How do vibration plates work? 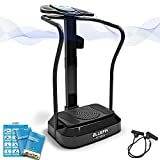 1.11 Which vibration plate machine should I buy? The vibration plate machine we are looking at today is the Upgraded Crazy Fit Massage Vibration Plate. This is a very reasonably priced model that has been upgraded and improved for 2017, and the manufacturers at Crazy Vibrations claim that using this machine for just 10 minutes works out the same as spending an hour at the gym (VIEW PRICE HERE!)! It’s important to mention here that vibration plates should be used to compliment a healthy diet and lifestyle. You can get a lot out of these machines if you are realistic about your goals and you are making an effort to eat healthily and cut down on junk food, but no matter how good an exercise machine is if you are eating a lot of high-calorie junk food it may well cancel out the positive effects of your machine. Adopting and maintaining a healthier lifestyle is a lot easier than people think, but it’s important if you want to get the most out of any exercise regime. The Upgraded Crazy Fit machine has loads of great features that will help make your workout productive and fun, and considering the price it’s quite a bargain! 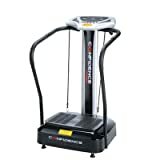 This Upgraded Crazy Fit Machine comes with 180 speed settings which is really important because it means you can adjust your speed over time as you improve. When you exercise you have to keep challenging and pushing yourself if you want to see real results, and as you improve you have to continue making your workout harder. If you just keep doing the same routine at the same speed it may well help you maintain your weight, but if you are looking for the best results you will need to keep increasing the pressure and this machine will let you do that. 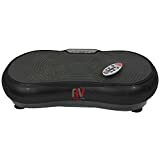 This Crazy Fit vibration plate machine also has 3 workout programs that you can choose from, so while your still getting used to your vibration plates you can follow these programs and select them based on your personal fitness goals. It can be really helpful to have in-built workout programs especially when you are exercising alone because it gives you a sense of direction and ensures you are following a proper routine. This machine comes with an inbuilt monitor that contains countdown timers, power buttons, built in speakers, and an audio jack for your MP3 player or iPod. It will also display the amount of calories you are burning, the speed you are working at and the amount of time you have been working out, which is really important because not only does it help motivate you by showing you the amount of calories you are burning and keeping you up to date on your progress but it also helps you set goals. If you decide you want to burn a certain amount of calories per session the calorie counter will help you keep on track, and if you have decided you want to work out for a specific amount of time and/or at a specific speed each day the display will help you keep track. The Crazy Fit Vibration Plates machine has a fast running motor which has a maximum output of 3900W. This motor is also virtually silent, which is an important factor if you live in a flat or you have room mates. The bigger and more powerful the motor is will typically determine how loud or quiet the machine is because bigger motors won’t have to push themselves as hard to run at high speeds, and so the fact that this machine has a silent motor is a pretty good sign. This machine uses anti-jamming mechanisms to help it run smoothly. The Crazy Fit comes with built in speakers which lets you hook up your MP3 or iPod and play music as you workout. This machine comes with a lifetime motor warranty, so if you ever experience problems with your motor or if the machine you receive is faulty it is easy to exchange it. Check The Lowest Price Here! If you’ve recently decided that you would like to get fit and/or lose weight you may feel a little overwhelmed with the amount of available options. There are loads of ways to get fit, but what works best for you will depend as much on what you enjoy as your fitness level and capabilities. Some people are perfectly happy to join a gym and spend an hour every few days lifting weights and using all the equipment, but others may find the gym inconvenient or intimidating. Other people may find that fitness classes or yoga really helps them keep fit, but again others may not have the time or may not enjoy group fitness activities. Luckily there are a lot of ways you can get fit and not all of them involve working out in front of strangers and these days you can purchase your own gym equipment and use it in the comfort and privacy of your own house. Even after you’ve decided to buy your own gym equipment there are still a lot of options. Some people swear by treadmills, but a lot of people find them quite hard to use and generally unpleasant. Other people may set up a weight lifting room in their house and invest in squat racks and dumbbells, but that tends to be quite expensive and many people find massive weights a little intimidating. The great thing about vibration plates is that they work your muscles and help you build up strength and tone your body without making you do any heavy lifting or excessive running. The way vibration plates work is quite simple. The vibration plates will move (either side to side or, with some more advanced models in multiple directions) and this will make it harder for the user to keep their balance on the machine. As you use the machine your muscles will constantly be tensing and relaxing as they work to keep your balance, and thus you will be able to give your muscles a work out without having to do anything overly strenuous. When you become more confident with your machine you’ll be able to increase the vibrations so your body doesn’t get comfortable with a standard routine, and you’ll be able to utilise more positions so you can concentrate on the specific areas of your body that you want to tone and strengthen. 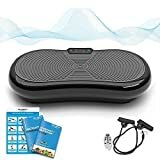 Vibration plates can be used by anyone, but they are especially good for people who are new to fitness or those who are a little older and don’t feel comfortable using treadmills or other standard gym machines. 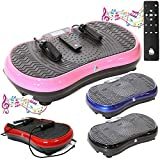 Vibration plates can help with osteoporosis and have been praised for their straightening ability, so they have a lot of unique perks that you could benefit from. 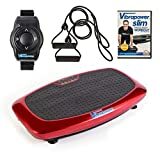 Which vibration plate machine should I buy? When you are buying a piece of gym equipment it is important to remember that you are making an investment in yourself and your health. You need to make sure you’ve made an affordable choice which doesn’t skimp on quality, and you’ll need to make sure your machine has enough levels and speeds that you can continue to improve over time.